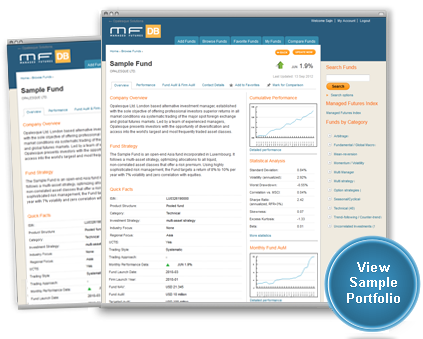 With currently 596 funds in 10 different strategy categories, the new Managed Futures Database is dedicated exclusively to managed futures funds and programs. It is accessible free for the subscribers of Opalesque Futures Strategies, the only research publication on managed futures and CTAs. Arktos Global Currency Program II..
2100 Xenon Managed Futures (2x) F.. Structured Markets Inc. 2x Standa..
Cranwood Capital Management : Fix..
NDX Capital Management : Abednego..
Revolution Capital Management : A..
Nordea 1 Heracles LongShort MI Fu..
WRG Modified Option Writing Progr..